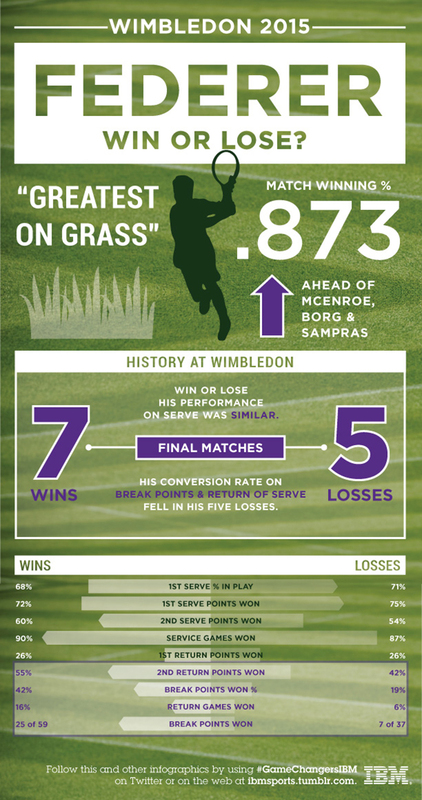 Wimbledon 2015: What qualities of Roger Federer's game makes him the Greatest on Grass? While Rafael Nadal is the “King of Clay” with his nine titles at Roland Garros, Roger Federer is the “Greatest on Grass," as his career match winning percentage on grass is the best of in the Open Era (.873) ahead of John McEnroe, Bjorn Borg and Pete Sampras. Looking at Federer's final matches at Wimbledon from 2003 to 2014—seven wins (2003-2007, 2009, 2012) and five losses (2008 final, 2010 and 2011 quarterfinals, 2013 second round, 2014 final)—it’s interesting to note that his performance on serve was very similar, win or lose. But his return of serve—especially returning second serves—and his conversion rate on break points fell dramatically in his five losses.